What Will Happen to Buddybuild at WWDC19? When Apple acquired TestFlight in 2014, they integrated it into App Store Connect (called iTunes Connect at the time), but kept the purpose of the service very much the same - allowing developers to easily distribute pre-release builds of their software. I'm curious as to the direction Apple will take with Buddybuild. I see a few ways it could go. Buddybuild could become a premium CI service, as it was previously, with a monthly or annual fee for developers to use it, with the intention being making money. I don't see this as the most likely outcome, but it's a possibility. Apple tends to build mass-market consumer services when looking to grow services revenue, not niche developer tools. Alternatively, Buddybuild, the service that we once knew, may return and be integrated into App Store Connect. Developers might have free, or inexpensive, access to a CI/CD service that will run tests for them, build their app, and distribute it where it needs to go automatically. This approach would interest me the most, and I think it's the most likely. The fact that they didn't shut the whole service down upon acquisition shows CI still interests them, and they have plans to continue the service, at the very least for existing customers, but I'm sure that will change. It would also mean Apple is exploring an area they haven't before - they would have direct access to source code, be it hosted by Apple itself, or pulled from a third-party code hosting service such as GitHub or BitBucket. A final approach which I believe is plausible would be that they take the technology behind Buddybuild (its integrations, build scripts, and hardware infrastructure) and use it for something else - such as remote code compilation. This could be especially useful should Apple be looking at bringing Xcode to iPad. I could imagine it being a bit like Google Stadia but for developers and their Xcode projects. It's also possible that none of the three approaches mentioned above are the route Apple take. WWDC19 is going to be an interesting conference, and I look forward to seeing what Apple has been up to in the world of CI/CD. The iOS version of Petty, my app for displaying real-time petrol prices in the state of New South Wales, was updated to v2.1 today. Feeling pretty lazy this weekend, but doing my best to put the finishing touches on the next update to Petty. * Adds additional Siri Shortcut for showing the real-time price at a given station. This will show up as a suggested Shortcut around iOS where it's relevant, and can also be added to Siri and can be accessed with your voice. This can be done by tapping the "Add to Siri" button at the bottom of the screen when looking at the prices for a particular station. Please note, this feature requires Petty Premium to be unlocked for it to work. * Updates to the design of the station view - the map takes up more space and is more of a priority on this screen. * Improved error handling if an attempt to buy the in-app purchase to unlock Petty Premium was unsuccessful. * Updated icon on Apple Watch. * Updates display name of Petty widget. * Added app version and build number to the bottom of the Settings page. * Lots of other small bug fixes and improvements throughout the app. I'm most excited about the additional shortcut. There are now a few things you can do with Siri Shortcuts inside of Petty - such finding out the prices at a particular station, or having Petty find the nearest or cheapest petrol around. This is especially handy if you're driving, can't look at or touch your iPhone, and need to use Siri hands-free to interact with your iPhone. I didn't write on this blog about the initial Siri features when I added them back in September, so consider this a belated introductory post. I'm pretty happy with how the shortcuts work in Petty, and I hope you enjoy using them just as much. Petty is available on the App Store as a free download, with a one time in-app purchase to unlock Premium mode. In the interest of becoming a better, more focused iOS software developer, I've been thinking a bit about the tools I use to work. iOS developers are fortunate not to need a lot of expensive software to be able to get their job done. Most of the expense associated with developing for the iOS platform comes from having to buy hardware; the Mac, iPhone, iPad, and Apple Watch aren't cheap these days. Once the necessary hardware is acquired, it's possible to get most of our work done with a few, "free" applications. Mainly Xcode and a terminal. While it's possible to do the job with minimal software, there are some tools which can make life easier, or boost productivity in ways not possible with the default software stack. When iOS development was exclusively a hobby for me, I never gave much thought to paid software tools. It's difficult to justify spending money on these things. Now, working in and around Xcode somewhere between 24 and 40 hours a week (depending on if Uni is in session), I've decided to allocate myself more of a budget for these tools. The benefit is two-fold, I find it easier to do my work - which is always a nice thing - and my increased efficiency benefits the person/people/company paying me to complete said task, as I'm likely to develop and test something faster, and move onto the next thing sooner. A further bonus is that buying these tools for work means I also have access to better tools when working on side projects! There are many tools out there for iOS developers. I've chosen three that I think are worth paying for, and am quite satisfied using myself. Git is the version control system of choice for most iOS developers. The full power of Git can is accessible from the command line, is installed by default on any Mac, and can be used completely for free. Git can be powerful but scary. No one wants to make a mistake and realise they've deleted a feature that's still in progress! Some people are amazingly skilled at using Git and all its features from the command line, but I am not one of those people. I prefer to use a GUI Git client, find that to be more friendly, and better suits how I use Git. There are a few popular GUI Git clients out there, including GitHub Desktop, Atlassian's Sourcetree, and Tower. Having used all three, Tower feels the most polished. I feel comfortable using it, and feel in control when performing actions with Git. I like having everything displayed in a GUI, and not having to rely exclusively on the command line. I recently upgraded from Tower 2 to Tower 3. Some features are "nice to have," such as support for dark mode in macOS. There are other new features which improve my workflow and productivity noticeably. Being able to re-write commit messages, and delete specific commits - generally before having pushed to remote - is fantastic! Completing these tasks from the command line would be tedious, and I'd be fearful of making a mistake! Considering I'm in and out of a Git client all day every day at work, and just as frequently when working on side projects, it makes sense to choose something that I feel comfortable with and can use efficiently. Although Tower is, under the hood, performing actions that you could do from a command line, or with an alternative free Git client, I see it as a worthwhile tool to have while writing software. Charles is a proxy service which will capture all network traffic from either a physical iOS device or from a simulator while developing, allowing you to inspect the network traffic being sent and received, as well as modify the requests and responses for testing and debugging purposes. There are certainly other ways to mock the traffic coming in and out of your app, but Charles is the most straightforward way I've found to do this. I'm also pretty sure Charles has a lot of great features I don't use, but even just for the basic inspecting and modifying of network traffic it's worth its money. One of my favourite features is being able to "breakpoint" a request, meaning Charles will always stop when a certain request is being sent or received, allowing you to modify it every time. Using Charles helps me feel a little more confident when working with API calls, knowing how easy it makes it test an app, check edge-cases, or throw data at an app during development before the backend API is ready for use. Though not an essential tool, it's one which I'm glad I have available to use and means there's one less thing to worry about when building iOS apps. A newer tool on the scene for iOS developers is Sherlock, a simulator UI inspection tool. It's different from the inbuilt Xcode View Hierarchy Debugger as it allows you to change UI on the fly, while the app is running in the simulator. It's a handy tool to test auto layout constraints, change label text and other UI element attributes such as colours, across multiple device screen sizes without having to build and run on a simulator each time. No setup is required. Sherlock handles installing itself on the simulator and attaching to the app you're currently running from Xcode. It's delightfully easy to use. While not an essential tool, I've found it to speed up my workflow dramatically when building UI, and is now a tool I wouldn't want to work without when doing iOS development. Good tools can make your work easier, and more enjoyable. Saving a few minutes at a time, multiple times a day adds up quickly. Everyone values different tools, but recently I've been quite impressed with Tower, Charles, and Sherlock, see them as worthwhile purchases, and wouldn't want to be doing my job as an iOS developer without them. I'm a huge fan of side projects. They're an opportunity to exercise creativity however you see fit. They provide you with a chance to work on something where you set 100% of the requirements. They give you a way to learn new skills and new technologies without any time constraints. For some, side projects exist only to the creator. They aren't built to ship, and they aren't built with the thought that anyone else will ever see or use the project. For others, myself included, one of the best things about working on a side project is the moment it's ready to ship. I enjoy working on side projects and enjoy shipping them just as much. In thinking about how to approach side projects going forward, I've come to realise that the kind of apps I want to work on as side projects typically aren't going to be fully-featured. At least at first. It's no secret that a considerable amount of my side project time over the last six months has been spent on a weekly podcast. Though it doesn't involve writing code, recording and editing the podcast has been amongst the most enjoyable side project work I've done. The podcast is time-consuming, and I don't necessarily have the time I once did to spend on more polished mobile app side projects - such as with Petty, and HeartMonitor - which were both mostly feature-complete at launch. Petty has received regular updates since its launch, adding features based on user feedback, but at the time it shipped there wasn't a whole lot more I'd hoped to add for 1.0. There are some side projects I'd like to start working on, but to get them to a point where I'm completely satisfied would take longer than is ideal. As I said, I enjoy shipping side projects. I'm thinking about a different approach going forward. It's not a new or novel concept, but I'm coming around to the idea of shipping the bare minimum and adding to it over time. I guess it's the software MVP approach. I'm not sure if shipping software with limited features will make adding additional features more motivating than if it weren't out in the world yet, but it's something I'd like to try. The idea of shipping more frequently can be applied to existing projects too. If new iPhones come out, why not release a small update that adds support? That's enough for one update; it doesn't have to wait until a bunch of new features are also ready. The intention is not to ship poor-quality software, but to have a wider range of public projects, and to ship updates to them more frequently. This might mean v1.0 isn't quite where I'd like it to be, but that's okay. It can then be followed up with fairly continuous updates. Add a small feature one week? Cool, ship it. Fix a tiny bug the next? Ship that too! Updates don't have to be huge. But hopefully, the enjoyment of shipping will still be felt from shipping fairly often. Software developers are lucky. We can build the software that we want to exist. Going forward, I'm going to try and ship more work more often, even if the project doesn't tick every feature box that I'd like for each release. So, we're making a podcast. It's called So cast, and it's an excuse for Kai, Malin and I to drink coffee and have a chat each week, since they moved halfway around the world. We're all software developers so, naturally, most of our conversations end up being about something tech related. Hopefully we're able to provide unique and interesting insights through these weekly discussions, and hopefully you find the show interesting enough to subscribe to. We've hit the ground running and have five great episodes for you to listen to. The show kicked off when we were fortunate enough to have access to the Apple Podcast Studio at WWDC, where we spoke about our WWDC experience. The second episode covers our early thoughts on the iOS 12 and watchOS 5 beta. In the third we discuss home automation and smart assistants, with a bit about Siri Shortcuts at the end. In episode 4 we talk about new MacBook Pros, and the 10th anniversary of the App Store. And finally in the fifth, we talk about everything from buying a new Mac, to what cloud storage to use, a whole bunch about emoji, and Apple Watch move streaks. We've got some great future topics planned, and plan on recording and releasing weekly. If the show sounds like something you'd be interested in, it's likely available in your podcast player of choice, including iTunes, Pocket Casts, and Overcast. If you've got any feedback, or would just like to find out when we release new episodes, you can follow the show account on Twitter: @So_cast. "Hey Siri, what on earth is a Shortcut?" At WWDC this year, Apple introduced Siri Shortcuts, which are a new way for developers to integrate their app with Siri on iOS, and watchOS. I'm in the process of writing a talk on Siri Shortcuts to present at the fantastic /dev/world/2018 conference in late August, and one of the things I'm struggling the most with is how to explain Shortcuts, and how to differentiate between the types of Shortcuts. From a developer's point of view, there are many things referred to as Shortcuts. This post is an attempt to clear the thoughts in my mind, and hopefully help clarify things for you too. In my experience from talking to people, "Shortcuts" tends to refer to Shortcuts the app, which is essentially Apple's replacement for the Workflow app after acquiring the team behind it in early 2017. The Shortcuts app allows you to chain actions together, and run them as a group. For example, you might have a "Running late" Shortcut that sends a message to your boss saying you'll be late, starts a "hurry" playlist, and opens Maps with directions to work. A lot of the integrations in Shortcuts at the moment are first-party actions - including controls such as toggling Wi-Fi or Do Not Disturb settings or interacting with built-in Apple apps. Shortcuts will shine once it's possible to run shortcuts (yes, that means something different here) as a part of the shortcuts you can create in the Shortcuts app. Have I confused you enough yet? There is a new Shortcuts API available to developers. In this context, a shortcut is an action or task that is often repeated with a somewhat predictable pattern. Developers are responsible for "donating" a shortcut to the system when a user performs a relevant action, and the system takes care of when and where to suggest the shortcut. Suggestions are displayed both on the lock screen as notifications, and under the Siri app suggestions when you swipe down on the home screen. Examples of shortcuts include suggesting a lunch order when it's nearing midday, or opening a document that you often open when you first get to work. These suggestions also appear on the Apple Watch Siri watch face. Shortcuts can be created in one of two ways. Firstly, using an NSUserActivity. You should create these for specific activities or screens within your app where a notable action is performed, and where there is a possibility of someone needing to return to the app in that state for whatever reason. NSUserActivity is used for handoff features allowing someone to pick up on one device where they left off on another. These activities can be "donated" to the system when a user performs a relevant task, and as long as the isEligibleForPrediction flag is set to true, they will begin to surface around iOS when they are relevant. A simple example of a useful NSUserActivity would be one that's donated every time someone starts a workout in a workout app. Over time, the system will get a sense for when this action is performed - perhaps when someone gets to the gym, or every morning at 6 am - and intelligently suggest it ahead of time. The second way to donate a shortcut is by creating an INInteraction, built specifically for shortcut functionality. An INInteraction contains an INIntent which describes the user's request. If the purpose of the shortcut is to resume state in an app, then similar to donating an NSUserActivity, handling an intent is done from the App Delegate with the application(_:continue:restorationHandler:) method. Here's where things get interesting (but maybe a tad confusing). Up until now, the shortcuts I've mentioned are good for simple suggestions. These suggestions, when interacted with, kick the user to your app where you handle the rest of the interaction. There's a lot of practical use-cases for that, but what about if you want to do more? It might not always be necessary to open the app to achieve a task. For example, if I order coffee at 9 am every morning through a shortcut, do I want the app to open every time? Not only is it slow, but I might not have an interest in customising the order - it's the same every day! This is where an Intents Extension comes into play. An intents extension allows you to run code from an extension bundle, meaning you can perform tasks without opening your main app, or touching code from that bundle. It is suggested that any shared code or business logic that the extension needs access to be moved to a shared framework, and then imported into the relevant targets in your project (including the intents extension) where it's used. It is also possible to start an activity from a shortcut, and then resume that activity in the app. It might be useful if you find the user waiting too long for a server response, but it is recommended to design with the idea that the entire activity or task be completed from the extension. Sometimes, a binary success/failure response isn't enough to properly convey the result of the shortcut that just ran. For this case, Apple provides an Intents UI extension which allows your intent to show a view controller and accompany the response with custom UI. These extensions are only supported on iOS (not watchOS). The only limitation to these view controllers is that they do not receive touch events. Design with the assumption a user is not able to interact with the view. Content can be updated as required, however. Extensions that use maps (e.g. Ride sharing) will already have a map provided by the system, so it's not necessary to also display a map in the UI extension. More on the different domains later on. Hopefully, at this point, you've got a reasonable understanding of a Siri shortcut, and understanding the different uses for the word "shortcut." I've written about intents up to this point with the idea that they're surfaced as suggestions, and run from either a lock screen notification or the shortcuts area of the Siri search page. There is another way that these Shortcuts can be surfaced around the operating system, and that's via voice command using Siri. You can suggest that someone adds a shortcut from your app to Siri via a button in your app to open an INUIAddVoiceShortcutViewController. A user can also add a shortcut to Siri themselves, from the Siri options in the Settings app. There is a convenience aspect to being able to run a shortcut from Siri, but one of the biggest advantages I've found to running them from Siri instead of manually is that you're able to provide voice feedback on the request. An Intents extension (without UI) will show the name of the shortcut it's running, as well as the app running it, and then provide a success or failure indicator, or optionally kick the user back to the main iOS app. There is no other feedback. With an Intents UI extension, visual feedback can be given through the UI. When a shortcut is activated with Siri it can provide voice feedback from the request to the user, regardless of whether there is a UI component, making for a great Siri experience. In this way, Siri can become conversational. Asking Siri something simple such as, "When is the next bus to the city?" or, "Are the Dragons up?" could return a voice-based response making it a great way to get an answer on the go, or when making the request from across the room. I believe that these shortcuts can be run from both HomePod and Apple Watch, even if the app with the Shortcut doesn't have an Apple Watch app. This might only be with certain categories of SiriKit apps, however. I haven't been able to test it yet. 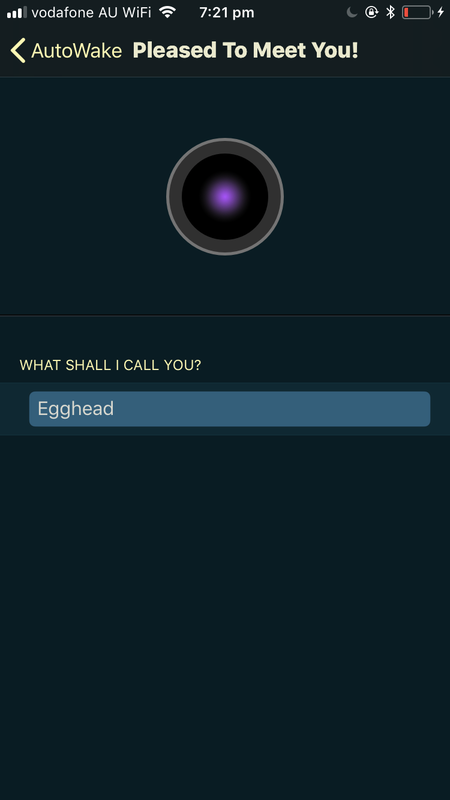 Integrating your app with a voice assistant is tricky. People talk in different ways. The way I ask for directions might be different from the way you do. How does a voice assistant know what you mean? SiriKit uses intents which are a type of request the user can make. Up until now, SiriKit integration has been limited to intents in specific "domains," as Apple calls them. These domains are Messaging, Lists and Notes, Workouts, Payments, VoIP Calling, Visual Codes, Photos, Ride Booking, Car Commands, CarPlay and Restaurant Reservations. Previously, if your app didn't fit into one of these categories, you weren't able to integrate with Siri. Intents for these domains aren't new. What is new is the ability for any developer to create a custom intent, meaning any app can integrate with SiriKit. Each action needs to have a defined intent. These are defined through the new intents definition file that you can add to Xcode, and include fields for any required parameters necessary for either the request or the response. With the old set of domains, there was room for ambiguity in the request. You, as the developer, could say that you didn't understand the request, or that you require more information. There's no room for ambiguity with the new domains as they're triggered by a custom phrase with no ability to input. At the time that a shortcut is added to Siri, the person adding it must tie a custom phrase to it. For example, you, a completely sensible human, might use the phrase, "Coffee order" for your morning coffee order, whereas I, a questionably sensible person, might use the phrase, "Banana peel." Shortcut intents can take parameters as far as you, the developer, is concerned. The same "Order coffee" intent that you define might have an option for the number of sugars someone wants with their coffee. However, the number must be set at the time the shortcut is added. A "coffee order" shortcut can't have one sugar one day, and none the next. If it's set up, the parameters are all the same. Different shortcuts with unique trigger phrases would need to be set up by the user if they wish to have multiple options available when ordering coffee from Siri. You might suggest that the shortcut is set up for a coffee with no sugar after a user places this order a few times, but once it's added to Siri, it cannot be changed without removing the shortcut or adding a new one altogether. Many hours later, this post has certainly helped me come up with more precise distinctions between the types of shortcuts developers can build into their apps, and what it means for users of these apps. I hope it can clarify some of the questions you have, too. Maybe now the next time you're talking to someone about shortcuts, you'll better be able to pick up on exactly what aspect of shortcuts they're talking about - Shortcuts the app, the suggestions, Intents, or the Siri Shortcuts. If there's anything I've missed, or you'd like to ask a question, feel free to reach out on Twitter. At the Apple Worldwide Developers Conference last week, Xcode 10 was announced with a bunch of new features and enhancements to various developer tools. One of the features that caught my eye was parallel testing. We should all be writing tests for our code. Unit tests run relatively quickly and are used to test small sections of code, generally in isolation. UITests are another form of test that, as the name implies, test the UI of your application. They do this by running through full flows in your app - such as a purchase flow from start to end - ensuring that all the expected UI elements are present and that each button and control works as expected. UITests are useful for catching regressions, and for feeling confident that nothing broke after making a change to your app, but unfortunately can take a while to run. Dozens of 30-second flows in your app add up, and suddenly you might find your test suite taking 30+ minutes to run. Previously only available to xcodebuild for separate simulators, and now available for all projects in Xcode, parallel testing allows multiple tests to be run simultaneously, with the main advantage being dramatically shortened XCTest and XCUITest times. 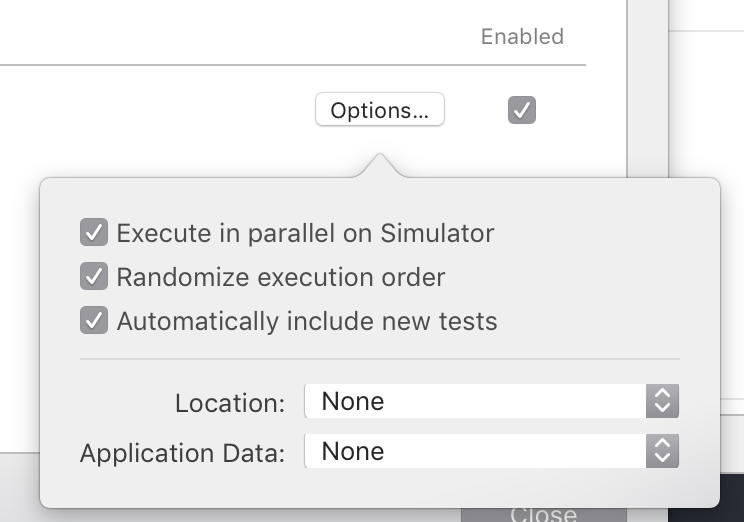 Select your target scheme in Xcode, and "Edit Scheme..."
Select "Execute in parallel on Simulator"
Optionally select "Randomize execution order"
It's only possible to run Unit tests in parallel on macOS. Both Unit tests and UI tests can be run in parallel on iOS and tvOS. When running tests in parallel, Xcode will run them on a clone of the same simulator. Most Macs should be capable of running at least two cloned simulators in parallel. Modern Macs with more RAM and more processor cores should be capable of running even more tests simultaneously. Tests are split up by classes and allocated to each clone of the simulator as Xcode sees fit. What this means is that your tests are only as fast as the longest-running test class. For this reason, it's important to keep each test class as concise as possible and consider splitting tests into as many classes as is practical. There are some things to consider now that tests can run in parallel, and optionally, in a random order. Ensure that tests are able to run independently of one another and that no test relies on the test that comes before or after it to set up or clean up. Each test should be truly independent of all other tests. You are no longer able to ensure that test A will finish before test B begins, so this independence is important. Performance tests will not achieve maximum performance when running in parallel. Apple suggests putting performance tests in their own bundle and disabling parallel testing for this bundle. Parallel testing certainly made for an impressive demo during the Platforms State of the Union at WWDC last week. It's something that will save countless hours of development time. Long testing time is something that may discourage additional tests from being written, and anything combatting that is a benefit to software quality going forward. Update (5th May 2018): HeartMonitor is back on the App Store. Update (12th April 2018): Late last week, HeartMonitor was removed from the App Store by Apple. I'm unsure if it will return to the App Store, but I'd like it to, and am working with Apple to hopefully find a way that can happen. HeartMonitor is an app for iPhone and Apple Watch that allows you to use the Apple Watch heart rate sensor to record "sessions" of heart rate activity - without having to start an active workout. The advantage of this is that HeartMonitor sessions have minimal impact on your activity rings. 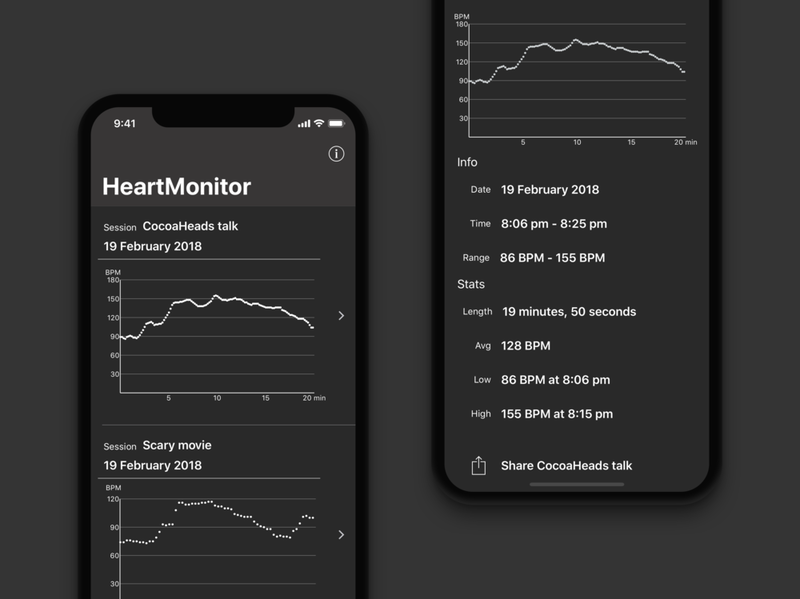 HeartMonitor is useful for monitoring your heart rate in nervous situations, such as while giving a conference talk or presentation, in the dying moments of a football game, or while watching a horror movie. HeartMonitor is also useful if you want to keep an eye on your resting heart rate for short periods of time. I'm sure that there are other creative uses - if you think of any, let me know! Almost two years ago, I wrote a blog post highlighting the case for a dedicated heart rate monitoring mode in watchOS - something that gives you the frequent heart rate readings of a workout session, but without having to start a workout and have your activity rings added to. There are issues with a feature like this. The original Apple Watch had mediocre battery life, and throwing in a 30-min heart rate tracking session would be enough to send the battery flat before the end of the day for most people. Since then, the Series 2 and more recent Series 3 have proven battery life is now a non-issue, with many Apple Watch wearers finishing the day with over 50% battery left. This leaves room for cool features that may use slightly more battery. It surprises me that there isn't a feature like this from Apple yet. When I wrote that original post, I was unable to find an app on the watch App Store that did this, and that was still the case up until the launch of HeartMonitor. It will very likely add unwanted activity data to your activity rings. There is no decent way to view the data afterwards. HeartMonitor solves both of these problems. While it isn't perfect, it is far less likely that your exercise ring will be added to. HeartMonitor will add to your rings if your heart rate gets high enough that the activity you're doing should probably be considered exercise, but unlike the Workout app, it won't count every minute simply because you've told it you're working out. HeartMonitor also solves the second issue of not having a place to view this data. The companion iPhone app will show you a list of sessions with detailed information and statistics for that session. From here, you can rename the session which makes it easier to remember what you were recording, and share the session with friends. HeartMonitor is completely free. Free to download, with no advertising, or in-app-purchases. There is no analytics framework (first or third-party) in HeartMonitor, no third-party code, and no tracking whatsoever. You can download it assured there's no hidden catch. So, what are you waiting for? Just open HeartMonitor on your Apple Watch to get started! If you like the sound of HeartMonitor, you can download it for free on the App Store. Feedback is always appreciated. I can be contacted here. The idea is simple. AutoWake is an alarm that wakes you in a lighter phase of sleep. The result? You feel less tired and groggy upon waking. Similar apps have existed for the iPhone for years. They require you to sleep with your phone on your bed, so they can detect motion as you sleep. AutoWake is the first to bring this to Apple Watch. I've been using it for a few months and have found it to work well. You configure AutoWake by choosing the time you wish to wake up by in the watch app. The alarm will go off up to either 15 or 30 minutes before that time (it's up to you), depending on your phase of sleep. AutoWake doesn't need to be open on the watch to work. However, you must have the AutoWake complication active on the watch face of your choice. I find either the extra large or the modular face work well as they both offer large countdown timers. AutoWake communicates with its iPhone app to work out an appropriate time to wake you. This means AutoWake also has to be running in the background on your iPhone. You can't force-quit the app as it needs to be active. You'll need to keep an active connection between your phone and watch, so neither can be in aeroplane mode. It wakes you up with a haptic alarm - like the alarm app built into watchOS, but with a more subtle and comfortable vibration. Should this fail, AutoWake will fall back and wake you up with audio from the iPhone app. AutoWake also triggers a heart rate reading in the seconds before it wakes you up, and shows it to you once you silence the alarm. Waking heart rate is a good indication of overall heart health, and AutoWake ties in with another of David's apps, AutoSleep, to make use of this data. Unlike almost every other alarm app, AutoWake doesn't have a snooze function. There's no dozing off after dismissing the alarm. After giving it some thought, it makes sense. If AutoWake works correctly and wakes you up in a lighter phase of sleep, you should wake feeling less groggy and more likely to get up straight away. There are a few apps that have had success due to the personality and character of the app. Carrot Weather is one that comes to mind. AutoWake also has subtle hints of personality which add to the overall experience. You can choose a name that AutoWake will refer to you as, and from there, its audio alerts will refer to you by your name. It's a small touch, but it makes a difference. I've got my name set to, "Egghead," and it never fails to amuse me when my phone says, "Sleep well, Egghead!" after setting the alarm. AutoWake is an app I've wanted to exist for quite a while, and I'm delighted that the initial version works as well as it does. AutoWake is available for a small upfront cost on the App Store, and is worth every cent.